Introducing dogs can be tricky! Like people, dogs have preferences for who they want to hang around and how quickly they warm up to others. When introducing dogs to each other, we need to stay very aware of this. We need to be prepared to end the socializing quickly if necessary. Dogs can build up grudges, and though a dog might tolerate other dogs who annoy him, the dog may decide at some point that he’s had enough. It’s best if you can catch this sort of thing early and stop it before it builds up! Step 1: Take structured walks together. With one person leading each dog, walk single file within 4 or 5 feet of the next person. Dogs are able to smell the dog ahead, getting to know him or her, while not putting too much pressure on the other dog. Rotate who leads so that each dogs gets lead AND follow. This is a great way to start introducing dogs to each other! Step 2: Allow calm social interaction in an enclosed or fenced area. Leave leashes on but have ZERO leash tension. Allow dogs to sniff and investigate each other for a few seconds, then lead them away. Repeat this several times. You want this to be calm, not playful or excited. Step 3: Drop leashes and allow dogs to freely walk around. Owners should walk around as well. Moving creates a nice flow that the dogs can follow and not get stuck in one particular place or around an owner. Again, we want this to be calm, not playful or excited. After you have done steps 1-3 for introducing dogs, and you feel like the dogs have gotten to know each other a bit in this way, you can allow more play and running around. This should be without leashes and collars as they can get caught in another dog’s teeth during play. And, dogs should always be supervised when playing or socializing. As owners, we are like the bouncer at the bar during this time. The bouncer stops or kicks out the person who gets too crazy or behaves inappropriately. 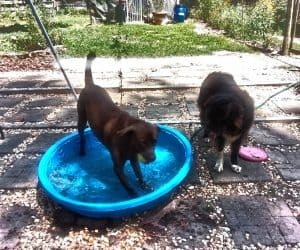 In the situation with our dogs, if play gets too rough, our dogs are struggling with the play style of another dog, or they just are done playing but are being pressured to continue, we need to step in and stop things. When dogs know they can rely on us to handle situations that come up, they will look to us instead of taking things into their own paws (or teeth). 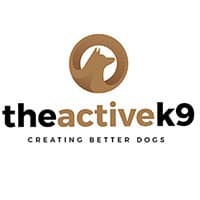 If you are struggling and would like some help with your dog, take a look at our dog training programs. We offer a variety of both private lessons and board & trains. You can follow us on Facebook for training updates and tips!